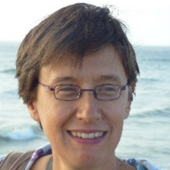 Florence Gazeau, PhD in Physics 1997, University Paris Diderot, is senior scientist in CNRS. PI of the Biother group (http://biother.net), she is recognized in the domain of nanomagnetism and nanomedicine. Her research interests include imaging and therapeutic applications of activable nanoparticles, nanotoxicity, life-cycle and long-term fate of nanoparticles, mechanobiology of cancer, regenerative medicine and extracellular vesicles for regenerative medicine and drug delivery. She is deputy director of the laboratory Matière et Systèmes Complexes (MSC) at USPC (Université Paris Diderot/CNRS) and one of the leaders for the creation of MSC Med laboratory (Université de Paris 2019). She is author of more than 136 publications (h-index of 46, citations >7500), inventor of 6 pending patents and cofounder of EverZom start up for the production of Extracellular Vesicles.